It was the stuff of comedians’ jokes about dead people voting and how many times people in Chicago vote. Well guess what folks, it isn’t a laughing matter anymore. Our republic is being stolen right from under our noses. When Donald Trump says that the election is rigged, he knows exactly what he is talking about. Recent videos released by Project Veritas show how important to Democrats election fraud really is and how systematically they have stolen election after election in this country. I wondered how people like Barack Obama and Hillary Clinton could even consider running for President; let alone win. Obama may have won the election fairly the first time; however, we will never know. His reelection was a pure case of voter fraud. This heresy isn’t only for presidential candidates. It runs the gambit from the Mayor of Chicago to every Democrat governor, congressperson and senator at both the state and local levels. Only when Republican voters turn out in massive numbers do they counter voter fraud. During the 2000 race for President, voter fraud was so rampant that Al Gore, a world class no nothing who wasn’t acceptable even by his home state of Tennessee, lost the election by only 500 votes in Florida, which decided who was elected President. There it is in a nutshell, our republic is being stolen, systematically and carefully orchestrated by the Democratic Party, from the lowest level, all the way up to the President. This writer has written books of fiction and could not have come up with a plausible plot line that would come close to what is actually happening in real life. Voter fraud isn’t going to stop because it has been brought to light just prior to the November election. These slimy people are going to continue until they are stopped. They are robbing our grandchildren of a future while they brag and laugh about it. If Donald Trump is elected President I am sure he, along with a Republican congress will investigate these allegations and people will finally pay a price for their foul deeds. If Clinton wins, it will only be due to the voter fraud and I, for one, will never accept her as a legitimate President. How could anyone accept her, knowing that nefarious forces are working to undermine the election results? Donald Trump was completely right in refusing to blindly accept the results of this election, knowing how absolutely crooked it is. President Obama loudly decried Mr. Trump’s refusal to accept the results of the election. Obama was a community organizer. They are the people who are organizing voter fraud and dirty tricks against Republicans. He knows first hand what people like Foval are doing. He did it himself. That is why he is so adamant that Mr. Trump must blindly accept the election’s results. The plot to steal our freedom is even bigger than these dark Democrat operatives. These people are global. What seemed unthinkable to me only months before now seems so obvious. What was wrong with me? Was I naïve? This heinous global community was right in front of my eyes, yet I did not see it. My eyes were opened this election as the forces of evil came together around Hillary Clinton like they never have before, in their support of this odious woman. The money flowed into Clinton’s camp like water spurting out of a ruptured dam from international bankers and global industrialists. They want this woman as President so they can pull her strings whenever they desire. Their support was almost overt in this election because an outsider was challenging their primacy. Mr. Trump had to be stopped no matter the cost. The cost was that they became reckless and their collusion was recorded. The public now knows through WikiLeaks and Project Veritas of the combined efforts of the Democrat Party and international bankers to steal the electoral process from Americans. We are seeing only a very tiny part of the big picture right now. The evil international cabal are the financiers of the people whose exploits we see as they brag about stealing votes and disrupting Republican events. Following the trail of money will be much more difficult than getting surreptitious Democrat operatives admitting to their criminal activities. OK, so I am mad as hell, what do I intend to do about it? This is the tricky part. I was a police officer and I’m a veteran. I take the Constitution very seriously. The framers of that Constitution knew that at some point people would come along and try to usurp our Republic. Within the framework of that document are the remedies to a tyrant trying to abuse the power of the people. It is the main reason for the first and second amendments. Hillary is such a tyrant. 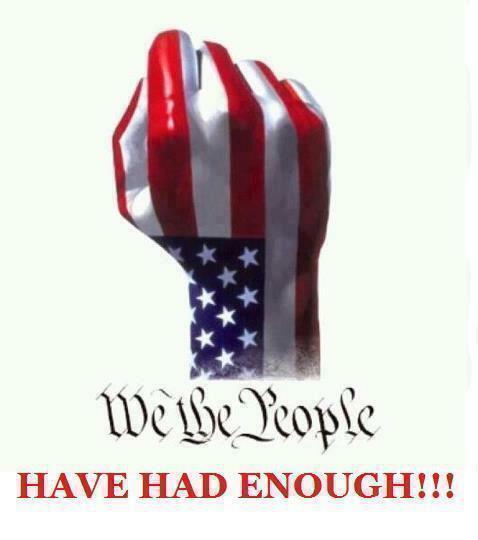 There can never be a time when our republic is taken away from the people through extra-constitutional means. Hillary means to do just that by undermining the Constitution, through a rogue supreme court appointed by her. Simply look at her words. She abhors the Second Amendment and has said many times that it does not give an individual the right to keep and bear arms. To her way of thinking it is only the government that has that right. That is what all tyrants say. It is how they remain in power, and why the Second Amendment is clearly written that the right of the people to keep and bear arms shall not be infringed. Hillary also hates religion. Religious people have a true moral standard that is in opposition to her lifestyle and beliefs. Both of those will disappear under a Hillary Presidency. Add to this the fact that we will never know if she earned the right to be our 45th President or if she stole it, and a real dilemma occurs. What do we do? I’m not going to take it anymore, that is part of the title of this article. I do not advocate violence in any way or manner. I do not advocate rebelling against the system, and it is way too soon to think about breaking the union apart. But I do advocate that we work very hard within the rigged system to stop Hillary from becoming President. On November 8, we must vote, get our spouses, family, friends, and neighbors, who only want to have a beer and watch the results on TV, to go out and vote. We must spread the message that America is in peril, all of us reading this must become modern day Paul Reveres and shout out to all patriots that they must vote. To beat the crooked Democrats at their own foul game, we must rise to the occasion and get voters out in massive numbers and vote Republican. After Donald Trump is sworn in as President, with a Republican congress to back him, I am sure that those vile Democrat operatives will finally get their day of reckoning. THIS GUY IS RIGHT ON AND I’M WITH HIM. PEOPLE JOIN AND LETS HELP TRUMP WIN. WE CAN NEVER LET DEMS TAKE CONTROL OF THIS COUNTRY EVER AGAIN AS THEY DID BY INCHES AND WE DIDN’T SEE IT COMING. WE FIGHT BACK WITH THE RIGHT PEOPLE ON OUR SIDE . THIS IS OUR LAST CHANCE –WE ALL SEE THAT NOW.!!!!! Wow. You gave no solutions that will work and told us the solutions that will work are ones we can’t do. And this is why we are in this mess.